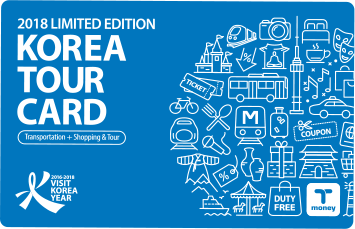 The new KOREA TOUR CARD 2018 LIMITED EDITION, a transportation card that can be used at existing affiliated places, will soon be available. The new card is being launched to commemorate the 2018 PyeongChang Winter Olympic Games and is expected to provide foreign visitors to Korea with more wonderful memories of Korea. The new card will be available from nine branches of Shinhan Bank, three branches of Woori Bank, and three Airport Railroad Travel Centers from 2018, and will offer holders the same benefits as the existing card. The method of use and payment with the card are also the same as the existing one.